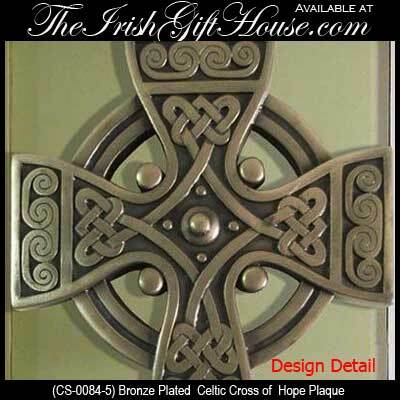 Bronze Celtic cross is a plated design for the wall that is enhanced with embossed knot-work. 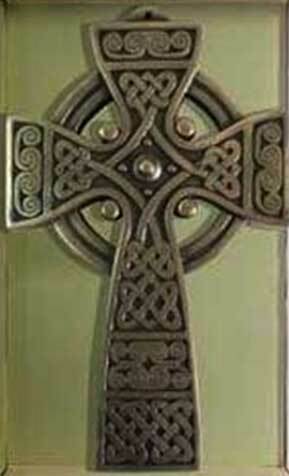 This Celtic wall cross is made in Ireland by Celtic Shadows. The Bronze Gallery collection features Irish gifts with intricate Celtic modeling that are inspired by the artistry of early Celtic craftsmen along with motifs of interlacing knot work. Each hand crafted cold cast sculpture is plated in bronze and carefully polished to highlight the elaborate detailing. This Celtic wall cross is called the cross of hope and it features hand crafted, cold cast bronze plated construction; it measures 5" wide x 8" tall. This Celtic cross has a dimensional design with detailed knot-work and is ready to hang on the wall. The cross of hope is gift boxed with Celtic knot and Celtic cross history cards, complements of The Irish Gift House. High Celtic crosses can reach heights of over 12 feet and the classic ring that connects the arms is a symbol of eternity. In ancient Ireland Celtic crosses were typically carved of sandstone or granite and indicate a holy place. Bronze plated Celtic wall cross features intertwined love knots and it is an ideal Irish wedding gift. Wooden shadow box features a dimensional Celtic cross that is enhanced with knot-work. Celtic wall cross is a large design that is crafted in solid brass with an antique finish. Celtic cross for the wall is a large brass design that is enhanced with embossed knot-work. Pewter Celtic wall cross features an all over embossed knot-work motif. Celtic wall cross is a silver tone design that features a satin nickel finish along with an embossed knot-work motif.